The investment will push GM's total spending in Flint to $2.5 billion over the past few years. General Motors' Flint assembly plant, the oldest in North America, soon will undergo an $877 transformation, continuing Flint's economic resurgence. GM officials today announced plans to invest $877 million to build a new body shop for the assembly plant. The project will move the body shop closer to the Flint Metal Center, which supplies sheet metal and other parts used in the Chevrolet and GMC full-size pickups produced in the assembly plant. The plant is popular for customers who want to watch their new trucks being built, firm officials said. Work on the 883,000-square-foot body shop is expected to begin in the first half of 2016, with completion slated for 2018. "This investment will allow us to use a more innovative approach to delivering material between two critical facilities, reducing handling and the time it takes to ship parts," said Cathy Clegg, GM North America Manufacturing and Labor Relations vice president. Since 2011, GM has announced investments topping $1.8 billion for Flint Assembly. This includes $600 million for plant upgrades and a new standalone paint shop that is under construction and slated to open in 2016. "In the last several years, GM's investments in the city of Flint have topped $2.5 billion, creating hundreds of construction jobs and an economic boost for the community," said Flint Mayor Dayne Walling. 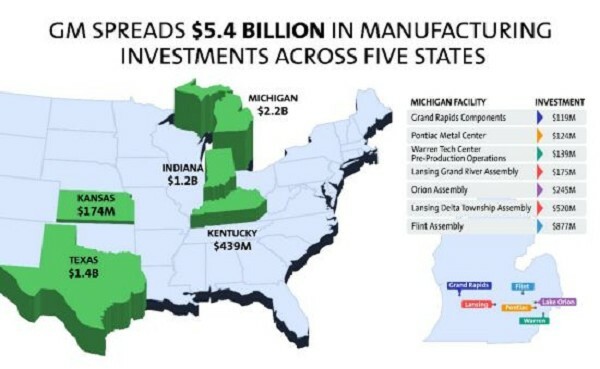 "This investment not only strengthens the ties between GM and the city, it demonstrates that Flint continues to play an important role in the resurgence of manufacturing in Michigan and the rest of the United States." Opened in 1947 as part of a post-World War II building boom by GM's Flint Assembly has produced more than 13 million vehicles. The plant's "View Builds," as they are called, allow customers to see their heavy-duty Silverados or heavy-duty Sierra trucks being assembled and roll off the line after a series of quality checks by members of UAW Local 598. "While the plant has received numerous awards for initial quality and long-term durability and reliability, our latest investments in the plant will raise the bar in vehicle quality and customer satisfaction," Clegg said. For starters, when the new paint shop opens in 2016, trucks will be painted using a wet-coat process that results in a smoother, more durable finish. The new body shop will be constructed north of the Flint Metal Center, reducing transportation time and handling between facilities. "This announcement is due to the hard work and dedication of our UAW members in Flint," said UAW Vice President Cindy Estrada, who leads the UAW GM Department. "This proves once again that when we work together in a collaborative approach, UAW members continue to come up with innovative ways to grow the business, which provides jobs and improves the quality of the products we produce. This is both good for the Company and good for our members." Today's announcement completes the $5.4 billion in investments GM and the UAW announced at the end of April. Since June 2009, GM has announced U.S. facility investments of approximately $17.8 billion, including $12.4 billion since the end of the 2011 UAW-GM National Agreement. These investments have created approximately 6,250 new jobs and secured 20,700 other positions.